Thanks for this clear and helpful post on social media strategy. Recently I started working as the Community Manager for a new museum in The Netherlands and one of my main aims is the use of Social Media. I am wondering if you have any thoughts on implementing Social Media plans/strategies in an organisation. What are pitfalls and how to overcome them? Thanks again and I'll keep on reading your blog. When it comes to implementation, one of the key needs is some kind of handbook that outlines clearly for staff how they are encouraged to engage, what tools might be useful for them, and what restrictions exist. I wrote a bit about this here. Every place has different struggles. You may want to check out this interview with the team from COSI, which is innovating their process throughout the institution. 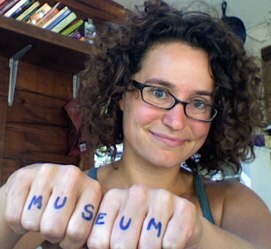 Also, Beck Tench runs a fabulous blog about her work bringing social technology to the Museum of Life and Science. Many thanks for this post. As with so many things, the concepts of initiating and integrating social media into organizations is often an overwhelming prospect. It sounds so easy, but where to start? Your focus on figuring out the audience and what's to be accomplished with/for that audience is precisely where organizations first need to put their creative thoughts. Choosing the social media to support those goals should then be a lot easier. Form follows function! After your experience with these museology students, do you still think museum studies students are zombies to beware of? Social media marketing is the process of promoting your site or business through social media channels and it is a powerful strategy that will get you links. Social Media Marketing Spend to Hit $3.1 Billion by 2014. I have a question, does social media marketing boost the bottom line? I am running some social media for small museums workshops in the coming months at Thinkspace at the Powerhouse Museum here in Sydney www.powerhousemuseum.com/thinkspace, and will be including this post and your blog in general in the reference links for participants. Thanks for sharing your work and ideas. Very useful thank you so much for sharing this!! This post is really a must for individuals or businesses that wanted to embark on a social media campaign. However, I would like to emphasize on the importance of formulating the milestone and the evaluation for each milestone to keep track of the plan.